Employees are the life force that holds a company together. They are the bridge that connects your customers to your product and service. Without our wonderful employees many company’s would not have the success they had today. So make your employee’s feel valued, and show them that you care, appreciate, and recognize their hard work and dedication by bringing Destination 2 Relaxation to relax and rejuvenate your hardworking team. Destination 2 Relaxation works with many companies to help create a stress-free, happy, healthy workplace with corporate chair massage, and pampering spa-wellness services at their office, health fair, holiday office party or corporate event. We can do the same for you! No matter the size of your company Destination 2 Relaxation provides a pleasurable and relaxing experience, with your budget in mind. We bring all supplies; from ergonomically design chairs, music, and aromatherapy. All you need to provide is the space. The massage is performed while the employee is fully dressed. Each massage and spa treatment is quick taking up to 5-30 minutes and no oils are used. 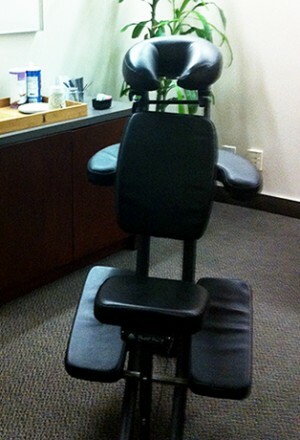 Destination 2 Relaxation offers on-set chair massage to re-energize your cast and crew. It’s a great way to promote wellness on-set, and let your cast and crew know that you appreciate their hard work, long hours, and dedication that they contribute to make your project a success! We also provide on-location hair stylists, makeup artists and nail technicians for a few hours, half day, or full day. Contact us today at 888-625-1755 or Click here to request a quote. 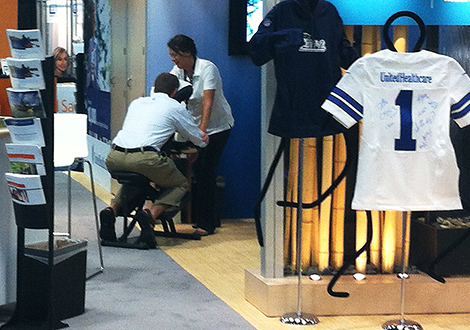 Looking for a way to drive traffic to your booth at your event? Chair massage is an effective way to generate a large crowd and to make your exhibit buzz with activity throughout the whole show. As the attendees wait in line for their massage, this gives you the opportunity to speak with your qualified prospects about key points about your product and service to increasing sales, secure appointments and create a wonderful brand experience for your potential customers. Using chair massage at any event is a great marketing tool to promote your business, bring in new customers, and retain the old clients you have. It’s also a great way to reward and pamper your exhibitors, staff, and VIP clients. Leaving every visitor with positive and relaxing memories of your company. Educating Visitors on key Points, Benefits and Features About Your Product(s) or Service(s). Wearing Your Companies Logo Attire. Handing Out Your Promotional Material. Recharging Your VIP Clients & Booth Staff. Company sponsored: The Company pays 100%. Employee Pays: Employees pay for their services. Split Pays: The company and individual employees split the cost. Click here to see other beauty & spa-wellness services to pamper your clients and staff.